Nurturing friendships while serving others; enjoying art, music, flowers, history and advocating for what's important. The more you do, the more meaning it may take on for you. This is what the Franklin Woman's Club means to me. 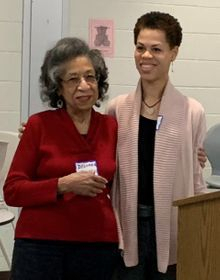 Membership Chair, Kecia Baptist (right), congratulates Delores Still on her 40th Anniversary as a Franklin Woman's Club Member! The Franklin Woman's Club (FWC) was established in 1922. In 1928, the club became part of the General Federation of Women's Clubs (GFWC). The GFWC, established in 1890, is an international organization with over 10 million members in 30 countries, a testament to their motto, "Unity in Diversity." GFWC members are the largest organization of volunteer women in the world! 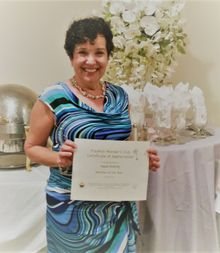 The GFWC, which is made up of 50 State Federations, (such as the New Jersey State Federation of Women's Clubs), is the umbrella organization to which local clubs belong. 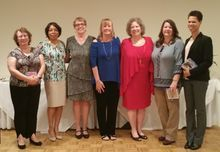 As such, the Franklin Woman's Club is a proud member of the New Jersey State Federation of Women’s Clubs (NJSFWC - College District), the largest volunteer organization in New Jersey. The FWC became incorporated in 1977. Click HERE to view a slide show of "Service Night" held in November 2018. Members worked on a variety of committees creating items to be donated that meet various community needs. Check out our Giving Back Page to learn more. Frequently through the year, events are planned around member interests such as: trips to flower shows and gardens, book clubs, art & craft classes, nature walks and more. This provides a great opportunity for learning and to develop friendships and new interests. Visit the Arts Creative and Conservation/Garden Pages for details. New this year - Cooking Classes, in which members will offer hands - on classes to teach fellow members how to make their favorite, family or ethnic recipes. Members keep each other informed of local, national and international issues and causes in areas such as human rights, environmental preservation and conservation, along with effective ways to have our voices heard by decision makers. Visit the Advocacy Page for more information. We are a dynamic group of women from all walks of life. Come to a meeting or event and see what we're all about. Visit the Meeting Info Page for details and photos from this year's meetings. We're hoping you'll agree that the Franklin Woman's Club has something for everyone! If you would like to attend a meeting for a sample club experience, please send a request using the message box at the top left side of this page. If you would like to join, please complete the Membership Application below. We look forward to meeting you! For Online application, complete form below or print downloadable application HERE. Membership involves attending as many club meetings as possible, keeping up-to-date with club happenings by reading the monthly newsletter and website, supporting club projects and events, serving once per club year on the Hostess Committee for meeting refreshments, paying annual dues and having fun! If you have any questions about this, please list them below. 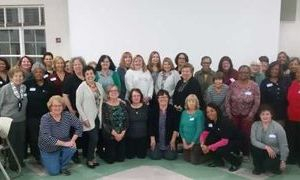 Membership Dues are $38 per club year ($19 if joining Jan-April) and can be submitted to the Membership Chair at a club meeting or you can mail your check (payable to Franklin Woman's Club) to Franklin Woman's Club, Attn: Membership Chair, PO Box 5793, Somerset, NJ 08875. If you have any questions about dues, please list them below. Photos taken at Franklin Woman's Club meetings and events are used to publicize the work of the club and promote interest for potential new members. Photos may appear on the club's website, in press releases, flyers or on our Facebook page. Please indicate if you grant our club the permission to use your photo for these purposes. Some of our committees are listed below. Please check your areas of interest or expertise.